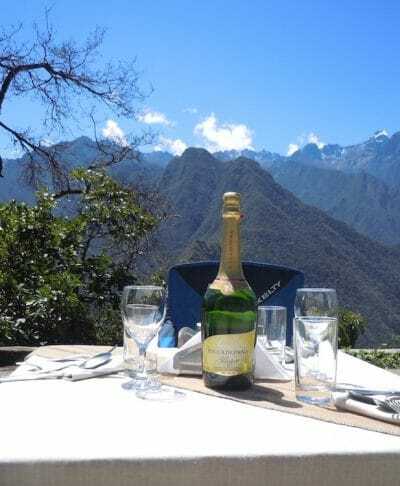 2018 Inca Trail Permits On Sale Now! Have you been dreaming about hiking the Inca Trail to Machu Picchu? If you want to go in 2018 (and you should! ), then you need to act fast! Inca Trail permits for 2018 are on sale as of mid October, 2018! This is by far the earliest permits have gone on sale for the upcoming season as they usually don’t go on sale until around the beginning of the year. Why do you need to act fast? There are only 500 Inca Trail permits issued each day from March through December (the non-rainy season), About 200 of those permits are for travelers like you, and the rest are for porters and guides who support you on your trek. Permits can only be purchased for individuals and are attached to the trekkers passport details; they are not transferable. That means when permits are sold out, they are completely sold out, and it is ins’t possible to trek starting on those dates. 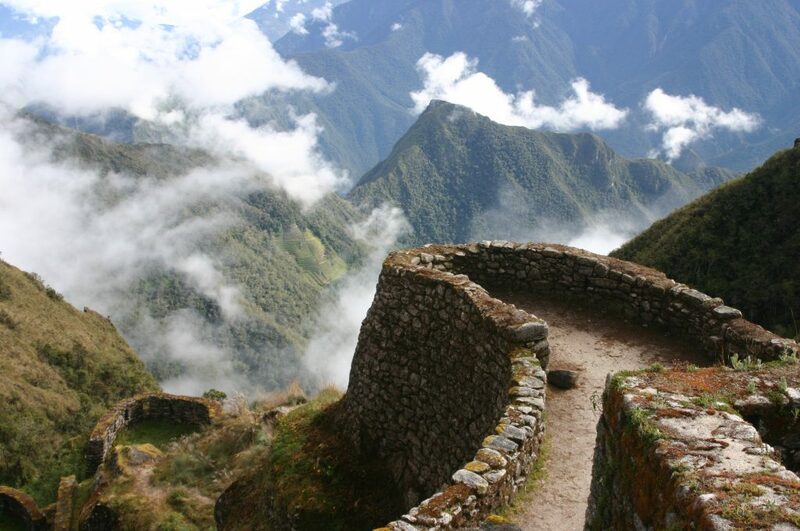 May and June are the most popular months for the Inca Trail, as the weather is warm and dry. Permits for these months have known to sell out the first day they go on sale! April, July and August are also very popular months, and they too have normally sold out in just a couple of days. Because the permits are going on sale earlier than expected, hopefully permits won’t sell out quite so quickly. But they still will sell out months in advance. If you want to trek the Inca Trail in 2018, you should move quickly while permits are still available. So how do you secure your Inca Trail permits? To trek the Inca Trail, you must travel with a certified trekking company, and be guided by a certified guide. This means you need to book a trip through a tour company, and they will purchase the Inca Trail permits for you (permits are needed for you, the guides, the porters, the cooks, and all camp staff – they will get the permits for everyone required for your trip). You will need to choose your dates, send them your passport information, and pay a non-refundable deposit with which to purchase your Inca Trail permits. The tour operator then goes in person to a government office to purchase the permits. It they are sold out, those dates are no longer available. How do you choose a trekking company? There are so many out there! That is where we come in! 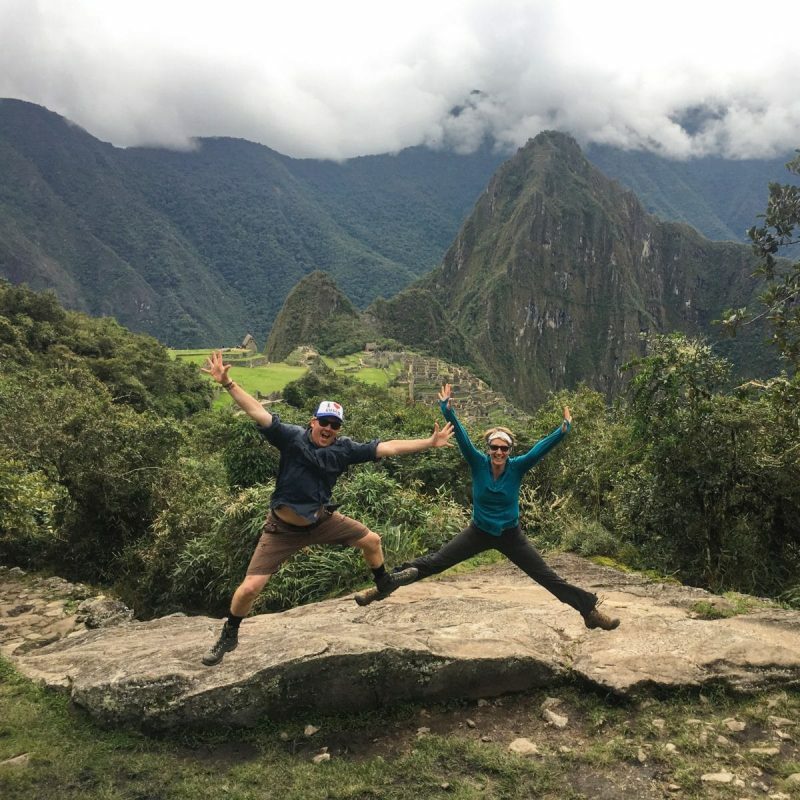 All of the travel gurus here at Detour have trekked the Inca Trail, we know what makes one trek better than another, and we have hand-picked the bet itineraries and local companies for you. You avoid the crowds on the trail and in camp. With 2,000+ people on the trail (500 starting the trek each day), the Inca Trail can be crowded, both on the trail and in campsites. The Ultimate Inca Trail Trek’s itinerary is designed to give you as much solitude as possible. Instead of starting the trek early in the morning of the first day as most people do, you relax over coffee and breakfast, explore the old stone town of Ollantaytambo, and then start the Inca Trail trek in the early afternoon. Since nearly everyone else starts early in the morning, you leave after most groups are long gone up the trail. You camp in different places than the majority of trekkers, and the itinerary keeps you behind those in front of you and ahead of those starting the day after you. 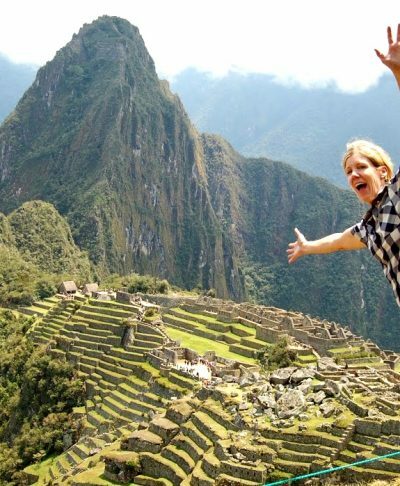 You see Machu Picchu twice! You see the ruins when you arrive in the afternoon of Day 4 via Inti Punku, the Gate of the Sun. 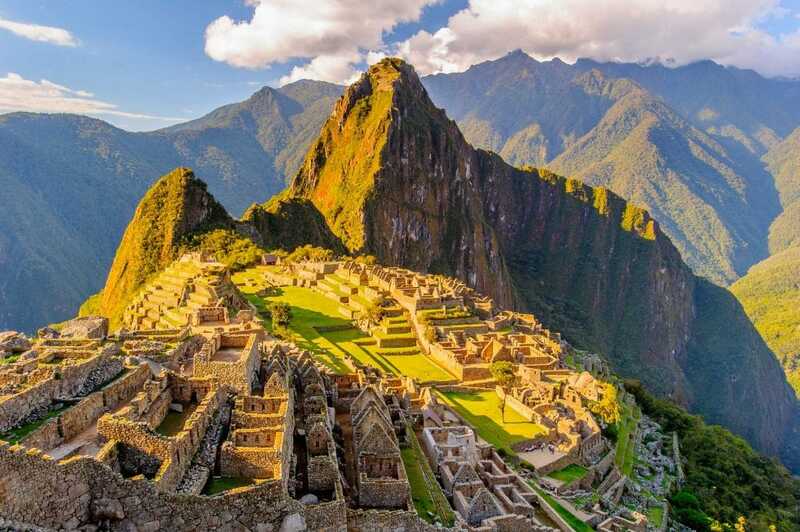 But, instead of touring the ruins and then heading to Cusco all that same day while tired from the hike, you head down to Machu Picchu Pueblo to get a good night’s sleep and a much-needed shower in a comfortable hotel. The next morning you head back to Machu Picchu, refreshed and rested, for your guided tour and then finally head back to Cusco that afternoon. Why rush the pinnacle of the trek and the reason you probably came to Peru? 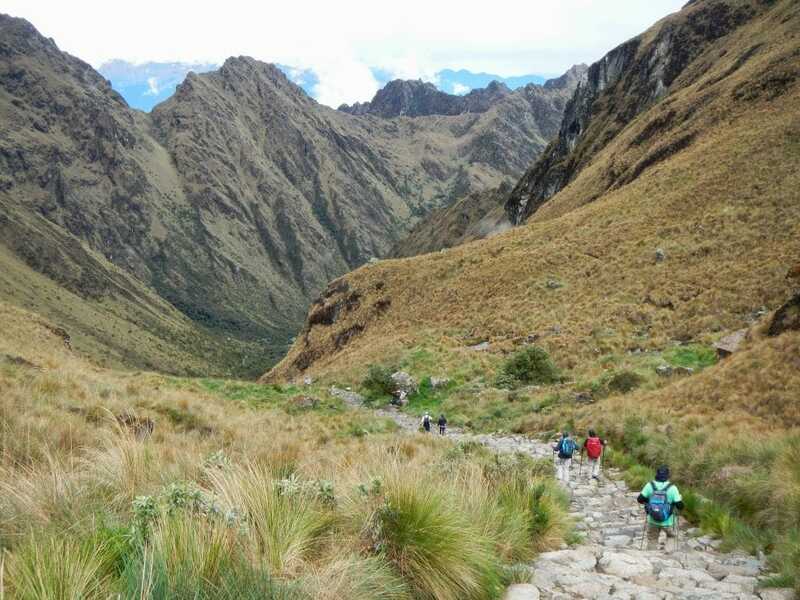 Read more about the differences between the 4 and 5 day Inca Trail trek. You have plenty of days to explore the amazing Inca ruins in Cusco and the Sacred Valley, while acclimatizing for the trek. There is so much more Inca history and living culture than just Machu Picchu! There are incredible ruins all around the area, and you don’t want to go to the area without experiencing them. Since you need to spend a few days before the trek at high altitudes acclimatizing for the trek (the highest point on the Inca Trail is 13,828ft / 4,215m), why not spend that time exploring more of this fascinating area with your guide and fellow travelers? You will camp in amazing comfort. Think three course gourmet dinners (also nutritious and filling! ), having coffee and coca tea delivered to your tent in the morning to help you wake up, a clean and odorless portable toilet and toilet tent so you can avoid the disgusting public outhouses, a table and stools for comfortable dining, and comfy sleeping pads and pillows. Porters will carry your gear and set up your tent. All you need to do is walk, explore, take photos, and then relax in camp. You’ll have one of the best guides in Peru! Amazonas Explorer, the company that operates the Ultimate Inca Trail Trek to Machu Picchu, has some of the best guides in the region. One was a professor of Inca history at a local University who found he preferred to do his teaching outside the classroom. Another was awarded World’s Best Guide by UK’s Wanderlust Magazine in 2014. They provide safety, humor, education, and smooth logistics to make your trip even better than you could have imagined. You are leaving a positive trace. Think about it. Every time you travel, you are impacting the local community and the environment, whether you mean to or not. Wouldn’t you rather know you’re leaving a positive trace, and that most of the money you spend on your trip is staying in the local economy? Amazonas Explorer, is locally owned and operated. They make sure all their operations are sustainably run as possible, from reusable cloth sacks for your snacks, to their office being off the grid, to offsetting their carbon footprint. They support their local guides and porters by providing living wages, health insurance, and extensive training and job skills development. They are Peru’s first member of 1% for the planet, donating 1% of sales to make the world a better place. They recently became a B Corporation, officially declaring that the there is a triple bottom line of profits, the environment, and local people. They have also planted nearly 500,000 trees to help reforest the Lares Valley. By traveling with them, you are helping to make the world a better place. Ready to book your Inca Trail Trek to Machu Picchu?? We’re ready to help you make that happen! Go to the Ultimate Inca Trail trip page and send us your contact info! You could be here in 2018! Get started booking your Inca Trail Trek to Machu Picchu today! 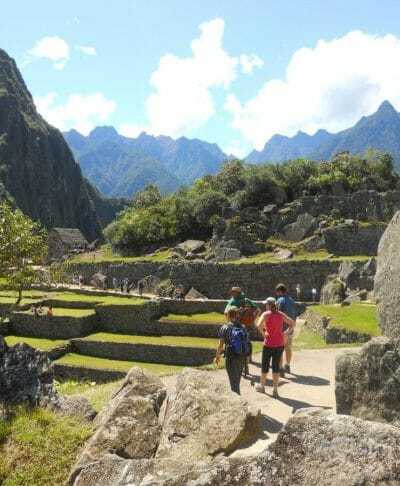 This entry was posted in Adventure Travel, Inca Trail Trek, Machu Picchu Travel, Peru Travel, Travel Tips, Trekking in Peru. Bookmark the permalink. © Detour, LLC. All Rights Reserved.